In this series of posts, we’ll see few great yet less known and under utilized tips/features those are there since earlier versions of Visual Studio and later made their way to SSMS (SQL Server Management Studio). I am sure, you’ll love these tips. 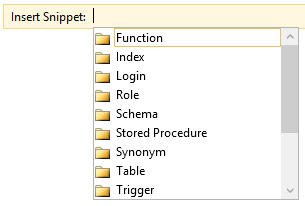 Have you used code snippet feature in Visual Studio? Aren’t they very useful? Code Snippets are reusable code templates those help to write code faster. What are Transact SQL code snippets? We’ll discuss about how we can create a Transact SQL code snippet of our own on a later blog post. For now, we’ll see how we can use them. Then choose the appropriate category and then the appropriate template to insert it in to your query window.